At 104 years old, Fillauer Companies has gone through a few iterations to become a global leader in orthotics and prosthetics. The story of Fillauer Companies, 2018 Spirit of Innovation Award recipient, is really two stories. Fillauer's Nexo product, which earned the company this year's Spirit of Innovation award, has all the earmarks of disruptive technology: it's a unique product that uses new design and advanced materials. Though it solves longstanding issues in an established product category, the Nexo itself involves no electronics and might not appear at first glance to be as technologically advanced as it is. Nexo is a system of components which fabricate a prosthetic arm for someone whose arm was amputated above or below the elbow. Wyatt Hogue, left, president of Adams Lithographing Company, and Michael Fillauer, president and CEO of Fillauer Companies, recipient of the Chattanooga Area Chamber of Commerce's 2018 Spirit of Innovation Award. In purely technical terms, the idea of a state of the art artificial limb might seem to be the one with the most electronics, like a sci-fi vision of nerves connected directly to a new body part. The closest the real world can come to that at the moment is a myoelectric prosthesis, where electrodes on the wearer's skin carry electric signals from flexing muscles to a battery-powered motor that moves the prosthetic. Fillauer makes these too. But the highest tech doesn't necessarily provide the best experience. Nexo is a body-powered prosthesis, meaning that it is attached to the body with a harness-and-cable system that translates upper body movement into opening and closing a prosthetic elbow or hand. "Most of the development in the last 20 or 30 years has been myoelectric, but body-powered is still a very common prescription for amputees," says Fillauer President and CEO Michael Fillauer, the fourth generation of his family to lead the company. "Body-powered prosthetics are lower cost, lower maintenance and lighter. They may look low-tech, so you might assume insurance wouldn't pay for anything better, but that's not necessarily the case. They actually respond faster than myoelectrics, and you don't have to worry about the battery going dead. A lot of users prefer them." A myoelectric-powered version of the Nexo is in development, but Fillauer developed the body-powered version first, because that's where the potential for innovation lies. Michael Fillauer says the innovative aspects of the Nexo come from advanced materials, modularity and focusing on function instead of technology. "A lot of times, companies focus on technology itself ... it's a microprocessor, it's got proportional controls," Michael Fillauer says. "What about the function the amputee wants? Because they don't care if it's electric. They want to pick up a bottle; they want to start the car with their keys. We're looking at the activities they want to do and not at the technology for its own sake." Nexo connects elbow to wrist with several rods made of polyether ether ketone (PEEK), an advanced material that Fillauer R&D engineer Steven Edwards calls a super plastic. Traditional plastics can be corroded by common workplace chemicals or even gasoline. Those super plastic rods make a Nexo arm feel better for the wearer. If the arm carries any weight, the residual limb is taking all the stress of the prosthesis, particularly at the point where the two connect. "When the wearer loads up the Nexo, the rods tend to flex a little bit, which takes some stress off their residual limb," Edwards says. "It feels more natural. Instead of feeling rigid and fixed, it's dynamic and flexible." "That kind of flexibility is unique to the Nexo," Michael Fillauer adds. "There's nothing else like that on the market." The Nexo's modular design means that if a prosthetic is broken or needs adjustment, it's easier than with other prosthetics, which commonly begin as components but are locked in place once customization is complete. 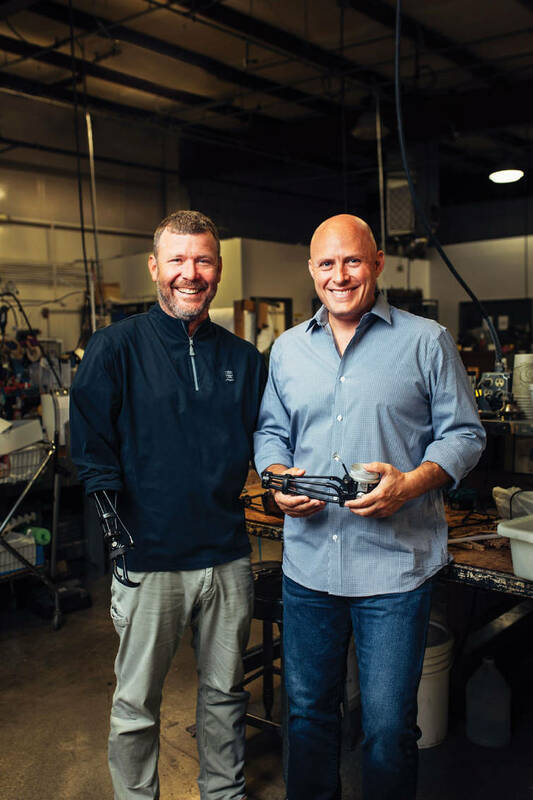 "Fabricating a completed Nexo arm can be done in two to three hours, compared to a day or day and a half for a traditional prosthesis," Edwards says. "If something is wrong with a traditional arm, there's not much you can do to change it. With Nexo, it's easy to replace or adjust only one modular element instead of creating an entirely new arm." Another key element in meeting patient needs with the Nexo is its weight. "If you can imagine wearing big clunky boots around all day, at the end of the day you're ready to take those things off. It's the same thing with a prosthesis," Edwards says. "Because the Nexo is so much lighter, patients can wear it into the evening hours. That makes a big difference for someone who's missing a limb." "Fillauer has always had a reputation for innovation, but for the last decade and a half, most of our innovation was happening at our subsidiary in Salt Lake City," Michael Fillauer says. "To be honest, for a while innovation was not happening in Chattanooga for us. We are recreating that innovation culture here." The company began in Chattanooga as a pharmacy and grew to selling pharmaceutical and surgical supplies as well as orthotics and prosthetics. The family-owned company merged with another company and went public as Durr-Fillauer in 1972. After a hostile takeover in 1993, Michael's father Karl Fillauer, bought the orthotics and prosthetics business and returned it to private ownership and to the Fillauer name. From 1996 through 2009, Fillauer grew by acquiring some of the most innovative companies in the industry, beginning with Hosmer, whose founder invented the iconic split hook. Other acquisitions became Fillauer divisions in California, Utah, North Carolina and Sweden. The Chattanooga headquarters became more oriented to manufacturing and distribution, particularly after Michael Fillauer's grandfather Carlton Fillauer passed away in 2002. "Grandad was the source of most of our innovation for decades, always coming up with new ideas," Michael Fillauer says. "He passed away while the company was more in acquisition mode and innovation was happening in other parts of the company. In the last five years, we're still open to acquisitions, but we've shifted toward organic growth. We're cultivating innovation in Chattanooga." For Fillauer, that begins with people. The innovative Hosmer division moved from California to Chattanooga in 2015. More people have been assigned to research and development. "In the past five years, R&D capacity has doubled," says Edwards, who has worked in the Chattanooga headquarters for 24 years. "My role is developing processes for our custom fabrication department. I also do product development, so I have a dual role. Others do, too." "Several key drivers have made it happen," Michael Fillauer says. "We put the right team in place, including new hires and people who have been with us for many years, and then we empower them." The Nexo development process is a good example. The R&D team worked closely with Wyatt Hogue, President of Adams Lithographing Company and a Chattanooga patient who often helps with product development, for three years before the final product went on the market in 2017. "We fitted our first prototype on Wyatt," Edwards says. "He took it home and came back with things that needed to be tweaked. We would 3D-print components or variations until we found one that would work. Then we would machine those parts and they'd go out for more testing." Once Hogue was in a functional prototype, the team added a second test patient, John Weaver, who works in the Chattanooga headquarters' Central Fabrication Department. His manual work load allowed the team to respond to a different set of user needs. "John was having vibration issues when using a hammer or drill at work, and the team developed a damping ring to buffer the vibration from impacting his residual limb," Edwards says. "Wyatt also benefitted from the ring as it made for a smoother ride on his motorcycle." "Over the past five years, we are proud to say that every product we have launched has responded directly to specific needs like these, articulated by medical professionals and their patients, and that is why we are successful," Michael Fillauer says. "As a company owned by certified prosthetist orthotists, our business model and values start and end with the patients wearing our products."